Cooking meat in a slow cooker is a good way to make a tender, beef dinner. By cooking the meat over a longer period of time at a low temperature the proteins break down slowly, resulting in tender, flavorful meat. By varying the other ingredients in the slow cooker, you can create different variations on top round pot roast. If you can, brown the top round roast in a very hot pan before putting it in the slow cooker. To brown your top round roast, put 1/4 inch of vegetable oil in a pan on medium or medium high heat. Turn the roast until it is evenly brown on all sides. Making a simple top round roast recipe for a main dish involves very few ingredients. Combine two cans of cream of mushroom soup with a packet of dry onion soup mix in your slow cooker. Add between 1 to 1 1/2 cups of water and stir thoroughly. Add a 5 lb. top round roast, cover and turn on low. Cook the roast for eight hours. For a variation on this, use vegetable beef soup or vegetable soup instead of mushroom soup. If your roast is smaller, add some diced potatoes to fill the slow cooker. For a traditional pot roast with carrots, combine 3 1/2 lbs. of top round roast, 1 to 2 tbsp. of olive oil, one large sliced onion, four peeled garlic cloves and four to six peeled, sliced carrots. Add a teaspoon each of salt, pepper and Italian seasoning, or to taste. If you have additional space, add some cubed potatoes or other vegetables. Place all the ingredients in the slow cooker, set at low and cook for eight hours. 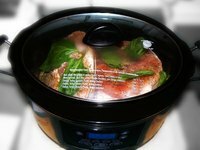 Another good technique with slow cookers and top round roast is to use a pork recipe, but substitute beef. For Hawaiian beef, add the following to a slow cooker: 3 1/2 lbs. of top round roast, a packet of teriyaki seasoning, 1 tsp. black pepper, 1 tbsp. chopped ginger, 2 tbsp. chopped fresh garlic, 1/2 cup vegetable broth, 1/2 cup brown sugar, 1/4 cup soy sauce or tamari, 1 cup chili sauce, a chopped onion, a couple of chopped carrots and 6 oz. of pineapple or pineapple juice. Cook for eight hours on low.